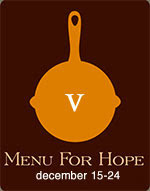 Cora Cooks: Menu For Hope V Deadline Extended! We are doing so well considering the economic climate, let's see if we could raise a little bit more money if we extended the campaign for a few more days. The new deadline for Menu for Hope raffle is December 31st, midnight PDT. Thank you so much for your support, and happy holidays to you and yours. Be sure to see the Master List of Prizes and then go to Firstgiving to bid on all the great prizes - including UE21, a beautiful Lemongrass 5 1/2 qt. Le Creuset Dutch Oven offered by Cora Cooks.